How does Rip Deal interact with upgrades installed in the root of HQ? If the Runner chooses to use Rip Deal's ability, they still access cards from the root of HQ, but those cards do not add to the number of cards that the Runner adds from the heap to the grip. If the Runner has an installed Nerve Agent, does it gain an additional virus counter before or after the Runner decides to use Rip Deal's effect? Before. Nerve Agent gains a counter when the run is successful. The Runner uses Rip Deal after determining the number of accesses that will occur but before those accesses actually occur. If the Runner has the ability to access three cards from HQ (such as through installed HQ Interfaces), but there are less than three cards in HQ at the time of access, how many cards can Rip Deal retrieve from the heap? The number of accesses the Runner will get is determined ahead of Rip Deal's resolution, and it is limited by the number of cards available to access. If used, Rip Deal will return as many cards from the heap as there are cards in HQ. If the Runner would access three cards from HQ, but there are only two cards in the heap, can the Runner still use Rip Deal to add those cards to grip? 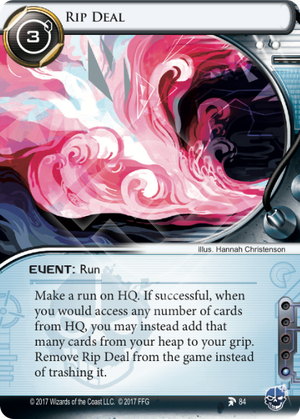 If the Runner would access three cards from HQ, but only wants two cards in the heap, can the Runner replace accessing two cards and access one card normally? No. "When you would access any number of cards" refers to the full set of accesses that is about to occur. Rip Deal suffers from the same problem as all run events: you can't combine them with events or abilities that require you to make a run. This is a bigger problem for Rip Deal than most run events because there's one card you'd really like to combine it with Legwork. The thing is, Rip Deal for 1 access is pretty inefficient. You pay 3 and a bunch more to get through ice just to recur a single card. HQ Interface works well to recur 1 extra card per Rip Deal. Unfortunately it will rotate out very soon. Nerve Agent really well for potentially recurring large parts of your heap, provided you can afford to splash it. But it will rotate out very soon as well. Neutralize All Threats lets you access 1 extra card from HQ at the dangerous cost of having to trash the first card you can trash each turn. And beside being fairly expensive to splash (3 influence) it also has anti-synergy with Aeneas Informant. The Gauntlet can realistically net you 3 extra accesses (assuming 3 ice on the server and no bypass or letting subs fire). Its big downside is that you have to give up Desperado for it. The Turning Wheel gives you extra accesses and works well with a Account Siphon heavy playstyle. Disregarding the cards that will rotate out in two packs (rotation hits when the first pack of the next cycle is released and there's one pack left to be released in Red Sands at the time of writing) and ignoring the weak and expensive Neutralize All Threats there are two major options: The Gauntlet and The Turning Wheel. The Gauntlet is very powerful if you can afford to do a straight run through ice without bypass tricks or anything. Since it gives you 2 you should be able to build a rig with it in a kind of criminal-does-shaper style. But as said, being a console it takes away your option to use Desperado and that's a high price to pay for criminals used to running 3 Desperado's. For more casual players this is less of a problem since a core set only has 1 copy of Desperado so people with only one core are unlikely to run Desperado anyway, even with two cores it's doubtful whether it's the best console considering you can include 3 of any other. The Turning Wheel is a card that's good for incidental multi-access if you do a lot of runs on HQ and R&D where you're not going to find agendas. Think Keyhole, Account Siphon, Security Testing. Those counters are valuable of course and you'll want to think very carefully about committing them to recur cards but often you'll advance your game plan more by recurring a high value card than by accessing an extra card, unless you have good reasons to believe there is a higher than normal chance that that access leads to an agenda steal. I've been reviewing Rip Deal from a criminal perspective so far but it's a 1 influence card and thus is easily to import into other factions. Since The Gauntlet and The Turning Wheel are 1 influence as well a Gauntlet/Rip Deal or Turning Wheel/Rip Deal combo is fairly doable in every other faction. Anarchs probably won't go for it since they have pretty decent recursion themselves in Déjà Vu and Trope. For Shapers a Gaunlet/Rip Deal is interesting since the 2 on The Gauntlet combines well with big rig. Shapers also have little recursion for non-programs aside from shuffling everything into the stack with Levy AR Lab Access. In the mini factions Adam stands out since Neutralize All Threats is often installed at the start of the game and if you have that already the economics of Rip Deal start to make (a bit of) sense. There's one little trick you can play with Rip Deal that, while janky and unreliable, deserves mention. Since the text says "you may instead add" (emphasis mine) you don't actually need to commit to recurring until you're at the server. Thus you could use Rip Deal as an expensive fake with the idea that if the corp thinks you're going to dig into your own heap they may not bother rezzing ice. I admit, it's a very long shot and I doubt corps would value recurring low enough to not make them rez ice, but if it works it's a sweet way to get past unrezzed ice. Now to the conclusion. I see the value of Rip Deal and it's potentially very powerful. But at the same time you're paying quite a lot of credits to recur cards if you count the cost of breaking. Because of that I think it's ultimately a card that's too weak to see much actual play.